October is one of my favourite months of the year. This month dramatic colours are painted across the landscape on many deciduous trees and shrubs. This is the final fling for many plants before they go to sleep for the winter. These colours can be enhanced by the soil that the plant is growing in. For instance Betula (birch) trees in the garden here turn the most wonderful hues of yellow with a tinge of orange as we are lucky enough to have acidic soil. Whereas at home, my birch trees turn lemon and butter yellows as I have a neutral soil. 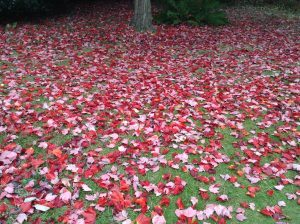 This can be put to great effect with plants such as Acers as their colours can be dramatically different on acid or alkaline soils. The autumn colours have started early this year probably due to the reasonably dry summer and the very cool week at the beginning of September. Hopefully this means that we are in for a nice prolonged splash of colour (as long as we get no wind). There are so many things that could be included in this month’s blog that I have had real trouble trying to decide what to mention. I hope you like my final selection and if you have any comments, please feel free to contact me. Liquidambar styraciflua ‘Lane Roberts’– A magnificent tree for autumn colour which is often mistaken for an Acer. The easy way to know the difference is by the leaves. The middle ‘finger’ of the palmate leaf is always longer than the rest on a Liquidambar. Whereas Acers ‘fingers’ are always the same length. This lovely plant prefers deep fertile soils that are moist but well drained. They do not like to dry out in summer. On acidic soils it turns scarlet and mahogany colours whereas on neutral or slightly limy soils it tends to turn more orange and yellow. This is a big tree but there are some smaller forms such as Liquidambar orientalis and Liquidambar ‘Gumball’ both of which have good autumn colours. Sorbus ‘Pink Pearl’ – A very good tree for medium sized gardens which produces masses of shiny pale pink berries in autumn and winter. 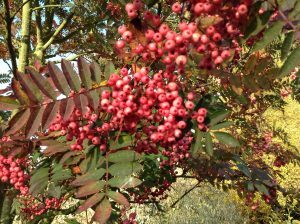 Like a lot of Sorbus (Rowans) it has very good autumn colour as well, turning rusty browns and deep reds. Good on any soil except wet, and forming an open and airy tree it creates dappled shade and therefore enables things to be planted right underneath it without problem. 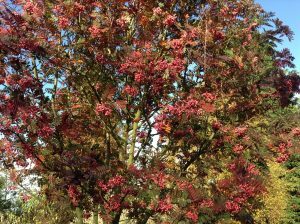 Other good Rowans for autumn colour include S. ‘Joseph Rock’, S. torminalis, S. ‘Olympic Flame’ (which is also known as ‘Dodong’) and S. ‘Autumn Spire’. 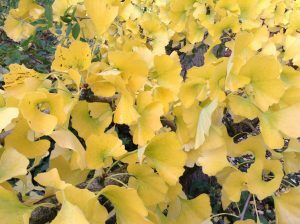 Gingko biloba (Maidenhair Tree) – This relic from the age of the dinosaurs is fascinating. It produces two lobed leaves in the spring which are a light green in colour and slightly droop to resemble a maiden’s hair. In autumn it turns a rich butter yellow which really stands out against the other autumn tones. These are big trees in general but there are some shorter varieties. 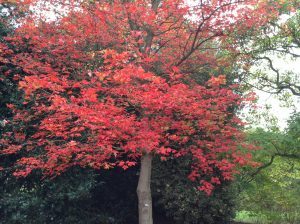 Acer rubrum– probably one of the best of all the autumn colour trees there is. A. rubrum will become a large tree but can be pruned to shape to keep it under control. 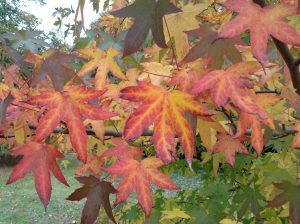 Like the Liquidambar it can be manipulated by soil type and therefore you can see it in different gardens in many shades over the autumn. On acid soils its turns scarlet and deep red and on less acidic soils; orange, scarlet and flame reds. There are a number of named forms which have very good colour during the autumn such as Acer rubrum ‘October Glory’ which turns brilliant red. Acer palmatum ‘Bloodgood’ – If some of the plants I have mentioned are too big for your garden then what about this lovely form of Japanese Maple? 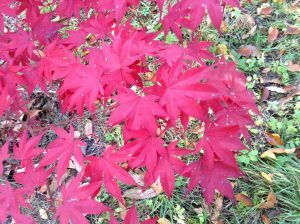 A. palmatum ‘Bloodgood‘ has deep burgundy leaves through the summer which turn the most amazing scarlet in autumn. It gets to around 3m (10ft) tall with time but must have acid soil to grow in. This does not need to be a problem as it can be grown in a container easily and so you can enjoy this colour transformation anywhere as long as you have dappled shade to protect it from the strong sunshine in summer. 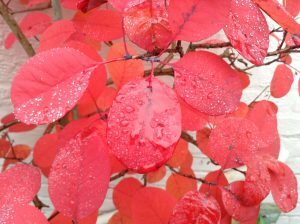 Cotinus coggygria– A beautiful shrub for the garden that has stunning autumn colour in September and October. 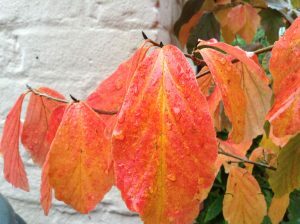 Continus coggygria is suitable for growing in a slightly more exposed position where it colours well. It can get quite large up to 10.5m (12ft) or more but can be grown in a container quite easily. The photographed A. p. ‘Bloodgood’ has grown in a pot in an east facing position. There are several good forms that colour well during the autumn such as C. ’Grace’ with its large leaves and brilliant red colour, C. ‘Flame’ which turns orange and yellow with a touch of red and C. ‘Royal Purple’ which can turn bright scarlet if we have some cooler frosty weather. Parrotia persica (Persian Ironwood) – related to Hamamelis (Witch Hazel) this plant is large growing, easily getting to 18m (60ft). 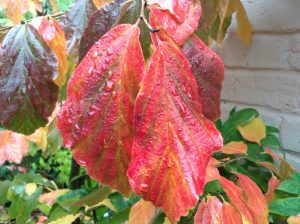 Parrotia persica prefers a slightly acidic soil which helps enhance the autumn colours. You may think that this plant is too big for you to grow at home, well, no it is not. The P. persica in the photographs is growing in a large pot at my home. 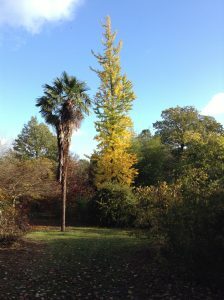 It is about 3.5m (12ft) tall and 0.5m (5ft) wide and, at the moment, is looking spectacular. It has a beautiful array of colours from lemon yellow through to orange, red and burgundy. I feed it from time to time and keep it well watered with rain water where possible in hot weather. I think that if you like a plant why not try it, there are no boundaries to how you grow them. Planting Bulbs – October is the best month for bulb planting as the soil is still warm to promote root growth and has some moisture from the recent rains (although we could always do with more). Ideally plant the bulb double its depth (as a minimum) as this helps to ensure that the flower stalks stand up in the early spring gales that we often get. There are bulbs for every situation whether it be containers, baskets, naturalising in grassland, planting in bedding schemes or just planting in borders. Make sure that you store them in a cool dry place, if you don’t have time to plant them straight away, which is frost and rodent free. 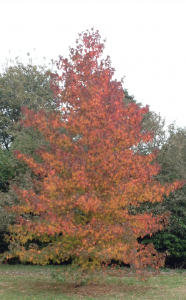 Events – Autumn Open Weekend Saturday 7th and Sunday 8th October – come and see our new range of trees for this autumn. We have a tour of the garden with Rupert Eley on each day over the weekend starting at 11.00am (booking advisable). We also have an advice centre set up in the first tunnel of the Plant Centre for all of your gardening questions. The Café will be serving Coffee, Tea and Cakes all weekend so pop along and have a great time.